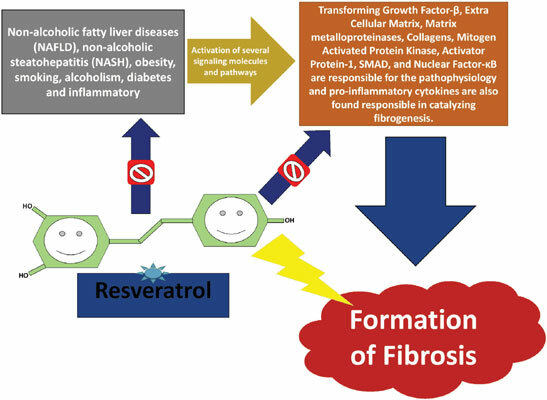 Keywords: Fibrosis, TGF-β, collagens, MAPK, NF-κB, Resveratrol. Keywords:Fibrosis, TGF-β, collagens, MAPK, NF-κB, Resveratrol. Abstract:Background: Chronic and non-communicable diseases such as non-alcoholic fatty liver diseases, non-alcoholic steatohepatitis, obesity, diabetes, cardiovascular dysfunctions, renal insufficiency, alcoholism and other inflammation disorders often lead to severe organ damage. Fibrosis, on the contrary, is a complex phenomenon that may turn into critical conditions if not treated properly. Several biochemical pathways and signaling molecules, for instance, TGF-β, ECM, MMPs, Collagens, MAPK, AP-1, SMAD and NF-κB are responsible for the pathophysiology. In addition to these, inflammatory and pro-inflammatory cytokines are also blamed to be responsible in catalyzing fibrogenesis.